After falling short in two of his ONE Championship outings last year, Filipino fighter Jimmy “The Silencer” Yabo seeks to start his 2017 campaign on a high note as he is set to take on an outstanding grappling prodigy. Yabo will test his mettle against Brazilian Jiu-Jitsu ace Bruno Pucci on the undercard of ONE: LIGHT OF A NATION, which takes place at the Thuwunna Indoor Stadium in Yangon, Myanmar on 30 June. The 36-year-old native of Lapu-Lapu City, Cebu has dropped two-straight matches inside the ONE Championship cage in 2016, yielding to Singaporean sensation Benedict Ang via third-round stoppage in May before suffering the same fate at the hands of China’s Ma Jia Wen three months later. Itching to enter the winner’s column once again, Yabo eyes a huge victory over Pucci in his fifth assignment as a ONE Championship competitor. Yabo is no stranger to highlight-reel performances as he boasts one of the best finishing percentages in ONE Championship’s featherweight division, having thwarted all five of his opponents by way of knockout. Although Yabo has experienced highs and lows throughout his nearly decade-long career, the rededicated veteran is looking to add one more win to his slate. According to Yabo, he aims to replicate his “Knockout of the Year”-candidate win over Pakistan’s Bashir Ahmad. 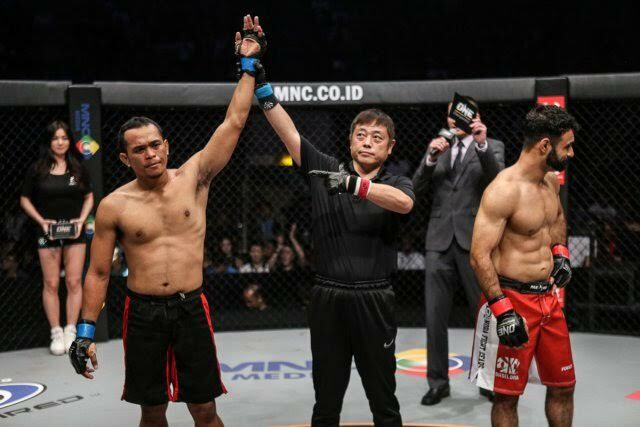 Yabo, a proud product of the local mixed arts martial scene in the Philippines, picked up his first win under the ONE Championship umbrella in February 2016 by knocking out Ahmad in just 21 seconds with a counter right cross. “One punch or one takedown can change a fight. I have to be the clear winner. I am prepared for this fight, but I need to execute my game plan suitably on fight night to go home with the win,” he said. Yabo believes that getting his hand raised against Pucci will open a door of opportunity, but he does not want to look past his gutsy opponent. “A win will put me on the right track. That’s why I want to get this one. I know it will not come easy. Although I am the veteran in this fight, I don’t want to be complacent. I will just do my best against Bruno Pucci,” he stated.